We had another great weekend recently. I just haven’t had enough time to sit down and blog about it. April, May and June always seem to get crazy busy around here. I can tell by the number of pictures that I take! It is interesting how sometimes Amara arrives for her visit with something very specific on her mind — like the day she arrived wanting to go to the beach. Recently she arrived and immediately wanted to ride our bikes. It was nice out so I didn’t mind but I asked her why? Her extremely logical answer was “Well we just haven’t done it in a while.” We rode bikes up and down our street for at least 5 minutes before the girls across the street heard us and came outside wanting to play. We put our bikes away and she headed off to play with two of them. Five minutes go by and the 3 of them are coming back here to play. One of them brought a box of colors but they decided to play Sorry! instead and I had to play with them to make it four players. They had me in hysterics! They got the giggles and kept pretending they couldn’t count. Trying to play any board game with a 7, an 8 and a 10 year old who have the giggles is a blast! I felt bad thought. The 7 year old just couldn’t get out of start. She kept getting the 7 card every time! After which she kept giving me the sweetest most pathetic and helpless look with her big brown eyes! It was crazy fun and I loved it. Grampy just sat in the office listening to the whole thing! The rest of the evening was pretty typical. We ordered pizza and watched Home Alone 2. Amara had really liked the first one and asked me to get the second one. It wasn’t as good but she loved all of the antics at the end. Then it was bedtime. She had gotten a new book, the 2nd in a series and so instead of a bedtime story she read to me for a while. Grampy tried to low crawl in and scare us again but Amara sat up and looked over the edge of the bed. He got a very good scolding! Sunday morning it got to be almost 8 AM and she was still sleeping. Grampy needed his tennis shoes out of the garage and you have to go through Amara’s room to get to the garage. We had checked on her when we got up at 6 AM and she was buried under all her covers. At 8 when I snuck in to get the shoes, she was sitting up in bed reading her book! She said she’d been reading since about 7 but came bounding out of bed. Book forgotten; we had muffins to make! We had decided the night before to make the blueberry muffins we didn’t get made the last visit. I thought I would be smart and line the muffin tins instead of greasing them. I will not make that mistake again as they did kind of stick to the paper but they were so yummy. Richard loved them. 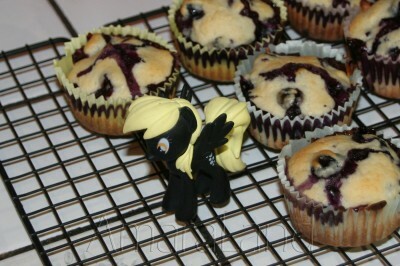 I do love cooking with her and this time we had a supervisor, Derpy. For those of you who don’t have someone in their lives that is completely obsessed with My Little Ponies, Derpy is the most popular of the background characters and Derpy loves Muuuufffins! (I know way to much about the Ponies!) 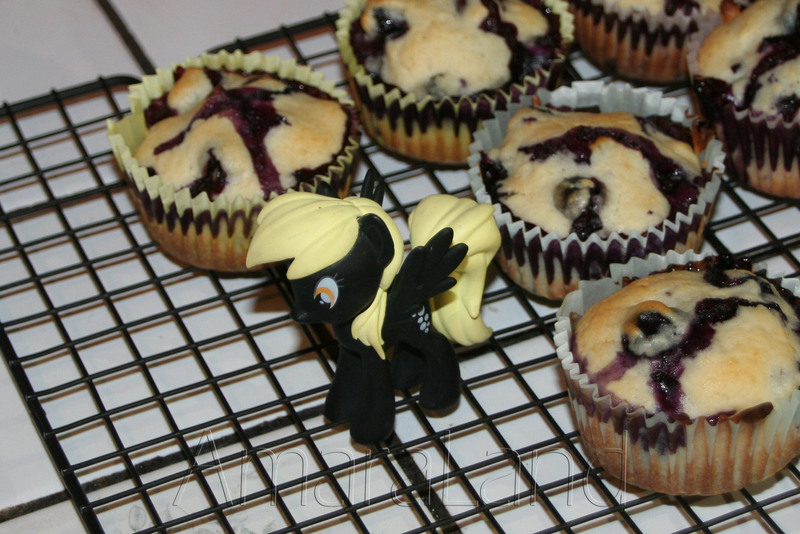 Derpy had to help Amara stir and he sat on the wire rack while they cooled. I really wish I had taken a picture of her plate with the muffin on it surrounded by Ponies! 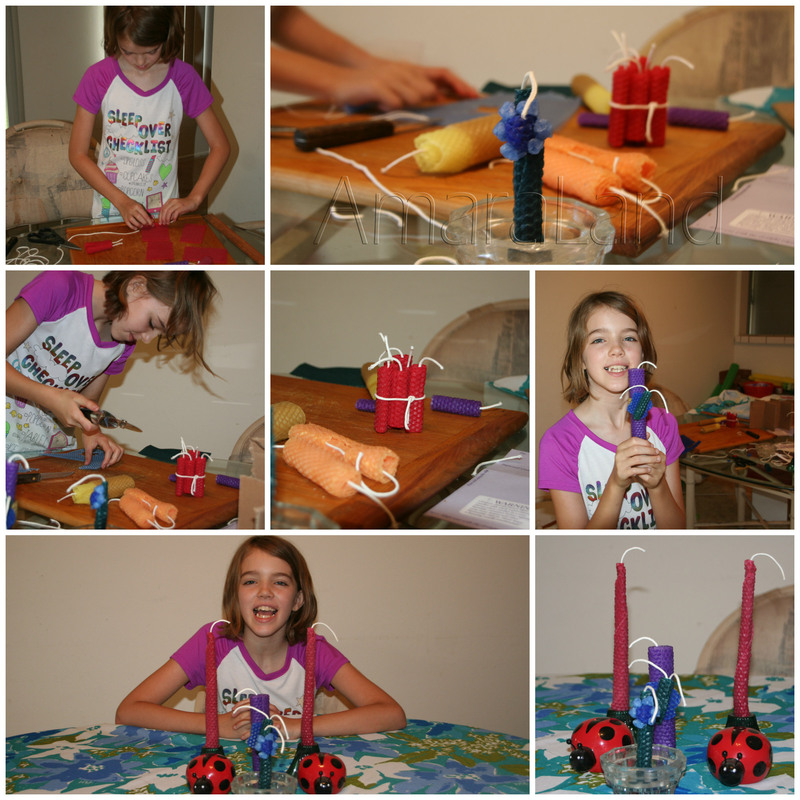 While the muffins were in the oven and while they were cooling, Amara decided she wanted to make candles. She finally remembered to bring the candle making kit that I had gotten her for Christmas. I cleaned up the kitchen while she worked on them at the dining room table and we talked. I love these comfortable times. She really wants me to get her some more sheets of the bees wax so that she can make more candles to use as gifts. She had so much fun showing all of them to her folks when they came to pick her up. She had used a sheet of the red bees wax to make dynamite! She is going to let Mo use her dynamite at the Gold Rush Days. It will make the perfect table decoration for the General Store. For about 10 seconds she considered letting Mo sell them but decided Mo could just borrow them! I am teaching Line Dancing of all things at the Gold Rush Days Friday. As Amara would say, “Dude, that’s just wrong!” I hate country western music. It is true; we will do anything for these kids! Fortunately, it is only for Amara’s class. Those muffins really were delicious. Amara liked them so much and was so proud she took pictures of them with her tablet and posted them on her new Pinterest account! This memory was posted in Indoor Fun and tagged Amara, blueberry muffins, candles, Derpy, My Little Ponies on June 10, 2014 by Grandma Kc. Pinterest account!–You really are getting that young lady off to a good start! Her parents let her have a Pinterest account and a YouTube account for her 10th birthday! She wanted so badly to be able to leave comments! Guess I am going to have to breakdown and cross over to the dark side one of these days and get a Pinterest account myself but I am holding off as long as I can as there just isn’t enough time! You really packed a lot of fun into just a couple of days!! 🙂 I’m glad Amara is enjoying cooking with you! Who knows where it will lead?? She could be a famous chef someday, or maybe even a fabulous wife like her mommy and Grandma Kc!! It works out so well that she cooks with me and that she sews with her other Grandma. I remember back to when Jenna was a teenager and most of her friends couldn’t even boil water! They couldn’t sew either! Who knows where it will lead but at the least she will always be able to fend for herself! I bet Brent would love these muffins, too! Bet he would even help make some! I had forgotten about Sorry! I bet Bubby would like that. The little player with you who couldn’t get out of START sounds like a sweetie. Interesting that you mention the boys not watching the show because it is for girls, there have been a few bullying incidents at Amara’s school this year where certain boys were ridiculed for liking the show. As for the line dancing – no! Thank you for the invite, but no! Tomorrow will be so much fun but these are kids that won’t laugh at me. Maybe another time! Hope you are having a wonderful week counting the moments until grandson number three arrives! Those muffins look so good. You two/three always pack in so much in the amount of time you have. Have a great day!!! We are lucky that we get to spend so much time with her and she really is so much fun! She and Grampy get into a lot of trouble together – good thing they have me to supervise! I’m always amazed, and bothered by how few kids have ever cooked or sewn. Maybe that will be a big benefit of Pinterest, create a little cooking, sewing, crafting revival. One of my about to be third grade campers has an account where she is already saving all of the teacher ideas she loves, including writing rubrics, crack up. I don’t get it either. By the time Jenna was 18 she was fully self-sufficient unlike most of her friends. Of course I love that many years later she still calls me to get “a key verifier” on something she is making for the first time! Makes a Mom proud! Does this mean your camper plans to be a teacher, too? That must make you feel very proud! This weekend it was blueberry pancakes and Careers. Such fun! While I invest lots of time preparing specific crafts and activities for the grandkids, I have to admit that just enjoying them while doing whatever unstructured thing comes to mind is the best way to live and create the happiest of memories! I enjoy reading posts like this. They remind me of “If You Give a Mouse a Cookie”! Grandma’s is probably the only place in the world where you are allowed to drift from one fun thing to the next while an adoring playmate sits beside you and savors every moment! You are definitely a super Grandma and the most crafty person I know – not to mention Queen of the Carnivals – but sometimes it is fun to just relax and enjoy the simple stuff. That really does get much easier as they get older, too! I’m also here to declare that I think girls are easier! I’m glad she’s coming over this weekend. Those pictures makes it seem like forever since I’ve seen her! Trust me, her obsession with all things Minecraft and My Little Ponies has not lessened one iota since you saw her last!